In the aviation industry, direct booking vs third party distribution has always been an either/or choice. Those days have come to an end. Emerging platforms like voice and bots, coupled with evolving online marketplaces, mean the lines are blurring. So the point where an intermediary’s relationship with the traveller ends and an airline’s begins is no longer as clear as it once was. The time has come to offer a fresh form of direct booking in metasearch. 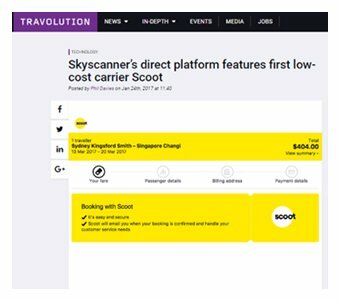 Here, after months of consultation with our partners, we set out Skyscanner’s vision offering the best of both worlds. All the benefits of ancillary up-sell and branding control, coupled with access to a growing and engaged audience of travellers across new platforms. After the turn of the century, distribution in the airline industry was a relatively simple affair. Direct distribution meant the customer going straight to an airline's website to make their booking. Everything outside of that in terms of Internet sales was considered third party, and that third party distribution came with a cost attached to it. As a result, the choice for airlines looked fairly simple: bringing traffic to airline.com direct meant generating bookings, which could then be effectively upsold at a far lower cost of acquisition. In the last decade, significant shifts have taken place both in the way travellers search and discover their trips, and the ways the aviation industry has made its flight products discoverable. Airlines have traditionally viewed direct bookings as only those that take place on their own site or app. This current landscape disrupts the old world of direct or third party. How did this landscape shift? First apps came along, offering an even more direct solution than websites, and a route to customers that cut out the more complex world of navigating the major search engines. Since then, technology has moved at pace and more recently messaging, chat bots and voice platforms have entered the fray, bringing with them the possibility for brands to meet users and interact with them on the devices they use daily. Platforms like Facebook and Twitter take this even further, being both entrenched customer interaction tools as well as providing environments for air ticket deals to be pushed. At the same time as travellers have experimented with new ways to discover trips, the airline industry has begun experimenting with more direct ways of presenting products to travellers. One carrier who has embraced the shift to mobile and even bots is KLM; the airline's CEO Pieter Elbers has even said he envisages a future where consumers do not visit its website. 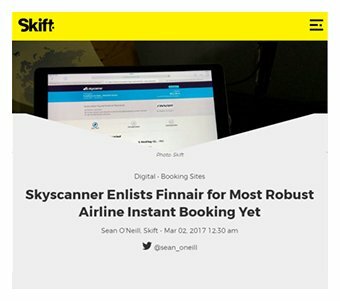 While most airlines have embraced social media to the extent that they now push air ticket deals via these platforms, some still have mobile experiences which offer more limited functionality than their sites and the majority are yet to fully engage with more cutting-edge platforms such as bots. Right now we are witnessing a new generation of distribution which offers fundamentally different ways to purchase. While the amount of information available has increased in recent years, screen sizes have decreased (and may eventually even disappear) so only a very limited number of flight options can be presented. Most importantly, these new services are creating even fewer steps on the path to purchase, so airlines have consequently had to be innovative about how they distribute their tickets in this new online environment. Concurrently initiatives like IATA’s New Distribution Capability (NDC) are pushing the industry to transform the way air tickets are sold to travellers, by allowing for integrations with more product differentiation and access to fuller, more dynamic air content, independent of the traditional GDS. Alongside this, many other platforms have been built offering APIs which connect deeper into airline distribution data, making transactions transparent and ticketing simpler. While airlines have therefore traditionally viewed “direct bookings” as those that take place on their own site or app alone, this current landscape disrupts the binary world of direct or third party booking. There are now a whole host of platforms within which a booking can take place; a booking through social media, or on a voice platform, or in a chatbot messenger will feel fairly direct to a customer for example, but would these interactions be considered direct or third party? What the current landscape looks like is arguably a spectrum, with direct distribution at one end, through to third party distribution at the other. At the third party end remains the OTAs and TMCs who are still heavily reliant on GDS, while at the direct end lies airline.com. Which points in the spectrum airlines choose to direct their distribution strategy towards will determine how things unfold; the way they approach new opportunities will be key, and will shape the future of airline distribution. So where does metasearch sit in all of this? As a collective, flight metasearch engines have begun to move towards "facilitated booking". This partly addresses the challenge of creating a seamless booking experience for travellers, through NDC and dynamic connectivity, however as we shall see the opportunities in this space are yet to be fully exploited. Other industries, such as e-commerce, have given supplier brands the space and control to display their products, offering a store-front of sorts, with abundant up-sell purchasing options baked in. The model for this has been particularly well-executed in markets like China, where shopping sites like Tmall offer suppliers "flag-ship stores" to brand their products in a way that is almost identical to their own sites. These are still marketplaces where sellers must compete for their business, but offer an online shop window for brands that provides the same experience to users as their own sites. Apply this to metasearch: the winners in this space - both among airlines and intermediaries - will be those that can see the value in bringing a rich and differentiated shopping experience to travellers, across the greatest span of platforms and devices. As a step towards this, travel metasearch engines have sought to streamline the process of searching and booking by moving to facilitate the booking stage of the process, giving travellers a more seamless experience through various forms of connectivity and APIs, including NDC. The airline marketplace that Skyscanner offers is already leading the field for connectivity to airline inventory. In fact, Skyscanner is the only global metasearch to have been recognised by IATA with Tier 3 implementation of the New Distribution Capability (NDC) in addition to supporting platforms such as Navitaire and Amadeus. Altogether that means Skyscanner offers carriers the ability to sell their fares to an audience of over 50 million unique monthly visitors, connecting to audiences and meeting travellers on an unrivalled range of channels and devices. The pace of innovation and change is accelerating, prompted by worldwide access to the Internet and the rapid development of mobile, among many others factors. In this scenario, the New Distribution Capability (NDC) standard helps modernize the way that airlines’ products are presented, providing consumers with greater access and transparency. For those airlines that choose to participate with metasearch companies, being able to deliver a full suite of airline products in this channel is a critical success factor. The facilitated booking model is becoming commonly adopted within the metasearch space. This is a positive start, but we believe there is more that can be done. The implementation of the model, and the degree to which it can offer a positive direct solution to airlines, is dependent on the airline brand being given the space to truly thrive in this marketplace. Many online sales scenarios create a form of two-sided marketplace involving both travellers and suppliers - this is certainly the case for metasearch. The two-sided marketplace is common across the internet economy. The reason it exists is the same reason the offline marketplaces exists: a place where buyers and sellers congregate, interact and transact. We believe that a marketplace which allows for a more direct connection between the customer and the airline will be beneficial to both parties, and that by allowing airlines to have greater control over their brand within our marketplace, we will facilitate a closer connection between customer and brand. The future, and what Skyscanner will aim to pioneer, leading the metasearch field, is more than the simple facilitation of the booking. It will offer airlines the opportunity to brand their experience more fully within the search and booking funnel, allowing for strong ancillary upsell and control over brand messaging – a store-front of sorts. At Skyscanner we believe this is where the future lies. It's our aim to offer a booking service that is as close to the direct experience as possible. We believe embracing this approach will reap benefits not just to airlines, but also for travellers. Airlines should take this option seriously and must plan for their products to stand out in the next generation of distribution, particularly as travellers migrate towards smaller screen sizes and shorter purchasing journeys. After all, people can’t buy what they can’t see. But our vision for the future is collaborating with airlines in delivering our version of the supplier managed marketplace to travellers worldwide. We want to bring airline products on our site as close to the direct experience as possible, with carriers controlling their products and brand while benefitting from our traffic, and audience, across that range of devices. This means offering a form of airline store-front. For travellers the experience on Skyscanner is then virtually indistinguishable from the experience on airline.com. So where are we now, and what opportunities are there for the future? At this moment in time, we are at a pivotal point in travel distribution. Gone are the days of airline.com websites versus everything else online. As users start to engage more and more with searching, booking and paying for their travel on the applications they use day to day, whether that be an app, via messenger or even voice, they will increasingly demand the ability to book these services instantly and without friction. This will be true, regardless of whether they find these tickets on a metasearch or an airline’s site, or indeed whether they are sat at home on a laptop or sharing deals with friends in a messenger chat. As an industry we must strive to offer the richest flight shopping experience for travellers whenever and wherever they need us – and that includes on everything from desktop through to social platforms and in conversations. As we enter this decisive era, where on-the-go services and mobile screen sizes take on a heightened importance, being part of a dynamic, brand-optimised online marketplace capable of catering to travellers on all devices is more vital than ever. It’s time to offer travellers the most dynamic form of airline fares and ancillary options with as little friction as possible. We believe that doing so requires travellers to interact fully with airline brands in the course of their online shopping journey. Not only do we envision that travellers - who increasingly turn to comparison sites to plan their trips - prefer this seamless process, but we know it delivers more return for carriers, who are empowered to showcase their brand and uplift the very products that increase bottom-line profit. Come on board and experience the benefits of our Direct Booking solution today.